CFN - CALIFORNIA FIRE NEWS - CAL FIRE NEWS : NWS-Sacramento Issued Red Flag Warning for a portion of interior Northern California. 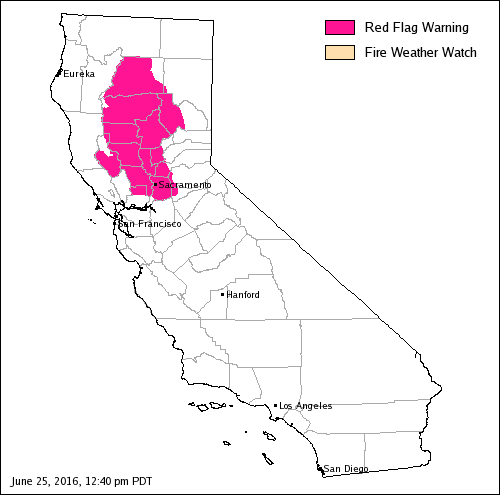 NWS-Sacramento Issued Red Flag Warning for a portion of interior Northern California. National Weather Service-Sacramento has issued a Red Flag Warning for a portion of interior northern California. It will be in effect from 2300 tonight through 1800 Saturday evening. AFFECTED AREA TODAY RESULTING IN ANOTHER DAY OF VERY LOW HUMIDITY. HUMIDITY WILL REMAIN ON THE DRY SIDE. PERCENT WITH LOW HUMIDITY THIS AFTERNOON FROM 8-15 PERCENT. * WIND...NORTHERLY WIND 10 TO 15 MPH WITH LOCAL GUSTS TO 25 MPH. DRY FUELS AND DRY NORTHERLY WINDS.